I declare before you all that my whole life, whether it be long or short, shall be devoted to your service and the service of our great Imperial country to which we all belong…God help me to make good my vow and God bless all of you who are willing to share it. The Queen’s relationship with her 12 Prime Ministers (eight Conservative and four Labour) over the past 63 years demonstrates how she has fulfilled that vow. Churchill was a formidable presence for the young Queen, who remained in awe of the great war leader. At their first audience, Churchill told the Queen he could advise her from a lifetime of experience, but the time would come when she would advise Prime Ministers younger than herself from a similar standpoint. So it has proved. The first of the 12 Prime Ministers younger than the Queen was John Major. Tony Blair and David Cameron were not even born when she acceded to the throne. The Queen has exercised all three rights. An early example was the issue of live television coverage of the Coronation in June 1953. Churchill opposed it, and, initially, the Queen was also doubtful. 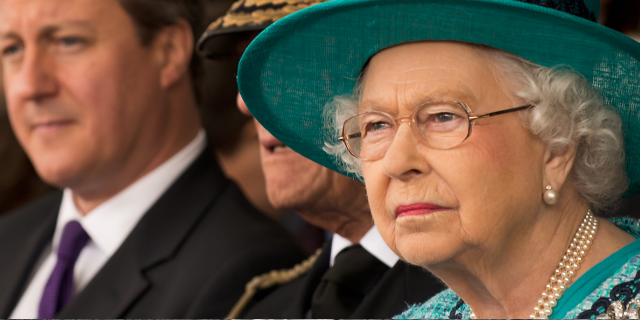 Eventually, the Queen’s view that the benefits would outweigh the disadvantages prevailed. Asked by an old court favourite whether Churchill was attempting to mentor her, as Melbourne had mentored the young Queen Victoria, she replied, ‘Not at all, I find him very obstinate.’ Nevertheless, she learned much from the old warrior. The weekly audience between monarch and Prime Minister remained a fixed point of contact. At these audiences, the Queen found her second Prime Minister, Anthony Eden, a sympathetic listener to her concerns. Dominating their early meetings was discussion of Princess Margaret’s possible marriage to the divorced Group Captain Peter Townsend. The Suez crisis in 1956 led to much speculation about the Queen’s views and what she knew of unfolding events. Eden believed that informing the Queen was of supreme importance and all the Suez papers were sent to her, the first time she was to be shown secret government papers. Their relationship was one of impeccable constitutional propriety and confidences were maintained. The Queen was able to draw on these experiences at later audiences with Margaret Thatcher during the Falklands War. The Queen has two prerogatives, to choose, or now to confirm, a new Prime Minister in office and to grant a dissolution of Parliament, triggering a general election. The first prerogative was exercised in 1957 and in 1963 when the leadership of the Conservative party became vacant between general elections. After taking advice from senior Conservatives, the Queen invited Harold Macmillan to become her third Prime Minister, a process repeated in October 1963 when Sir Alec Douglas-Home was appointed. At first, the Queen did not find Macmillan easy to deal with. He was unsure whether the Prime Minister’s annual visit to Balmoral was a social occasion, with ‘talking shop’ relegated to the margins, or a Highlands version of his weekly audiences at Buckingham Palace. However, it was not long before they were on the same wavelength. Indeed, the Queen soon came to rely on Macmillan to offer wise counsel, both while in office and after his retirement in 1963. They discussed issues including the inauguration of the memorial to President Kennedy at Runnymede in 1965, and the 250th anniversary of 10 Downing Street in 1985. Crucially, the Queen also sought his advice following the uncertain General Election outcomes of February and October 1974, when he advised on historical precedents. When Macmillan resigned in October 1963, accusations were made that the Queen had colluded with his supposed blocking of the Deputy Prime Minister, Rab Butler, as his successor, leading to the controversial appointment of Alec Douglas-Home as the new Prime Minister. In fact, the Queen had distanced herself from the process, both physically – by staying out of London, at Windsor Castle – and personally – ensuring that her Assistant Private Secretary Sir Edward Ford was the conduit between the Palace and the Prime Minister’s Office. The Palace made it clear that the choice of a new leader should be for the Conservative Party alone, a process known as ‘You Choose, We Send For’. Far from colluding, the Queen maintained the monarchy’s political impartiality, waiting for a name to be brought to her. Subsequent events eroded the Queen’s prerogative. From July 1965 onwards, the Conservative Party elected its leader, as the Labour Party had done since 1922. Today it would be highly unusual if the Queen invited anyone to become Prime Minister who was not the acknowledged leader of the party commanding a majority in the House of Commons. Outgoing Prime Ministers in mid-term have made things easier for the Queen by staying-on until their party has elected a successor, including Harold Wilson in 1976 and Margaret Thatcher in 1990. When Sir Alec Douglas-Home became Prime Minister in October 1963, for the first time the Queen had a Prime Minister whom she already knew as a friend, Home having been a childhood friend of the Queen Mother. She was now in the unusual situation of having to formalise a relationship that had always been informal. When Home went to Balmoral for his first Prime Ministerial visit, he heard for the first time the sound of the Queen’s official bagpiper before breakfast, an experience he would not have had on his previous visits as a family friend. Over the years, Home often helped the Queen to name royal horses. After hearing the Balmoral bagpiper, Home suggested the names ‘Blessed Relief’ [by] ‘Bagpipes’ [out of] ‘Earshot’ for her three new foals! James Callaghan observed that that the Queen provided friendliness, not friendship to her Prime Ministers. Wilson and Callaghan, her first two Labour Prime Ministers, both got on famously with the Queen. Wilson enjoyed the informality of helping with the washing-up after the Balmoral barbecues, unlike Thatcher for whom these weekends interrupted work. Wilson noted that the Queen respected those who had served in the armed forces, which made her relationship with Callaghan, who had been in the Royal Navy, so relaxed. The relationship with Edward Heath was not always easy, as his world-view differed sharply from that of the Queen. European integration was Heath’s vision. The Queen, however, saw her role as Head of the Commonwealth to be of supreme importance. For this reason she lamented the loss, in 1997, of the Royal Yacht Britannia (a decision wrongly ascribed to Tony Blair, but in fact inherited from the Major government), which had enabled her to visit the smaller, more remote Commonwealth countries. Much attention has been paid to the Queen’s first prerogative, the right to appoint a Prime Minister, but little to the second, the dissolution of Parliaments. So far in the Queen’s reign there have been 15 such dissolutions, the two, indecisive elections in 1974 being potentially the most difficult. Returning from Australia in February 1974, the Queen’s role proved invaluable in a volatile and uncertain political climate. However, the recent Fixed Term Act, setting a statutory, five-year parliament, has in effect removed that prerogative, except in the most unlikely of circumstances. In 1952 when she came to the throne, the Queen could choose the Prime Minister, and could grant, or not grant, a dissolution of parliament. Now, in effect, she can do neither. The party commanding a majority in the House of Commons presents its accepted leader to the Queen after a General Election or a change of party leadership in the governing party. The date of the General Election of May 2015 was predetermined by the Fixed Term Act, as will the next General Election in May 2020, unless two-thirds of the Commons decides otherwise. The changes brought about by the Fixed Term Act do not weaken the Queen’s ‘dignified’ position; on the contrary they remove her entirely from the political arena. Copyright D R Thorpe. This article was produced as part of the No10 Guest Historian series, coordinated by History & Policy. My Queen- from the lowest servant of the Crown - my the highest congratulations !!! A role model for any patriot. Long live the queen.